This is the end. 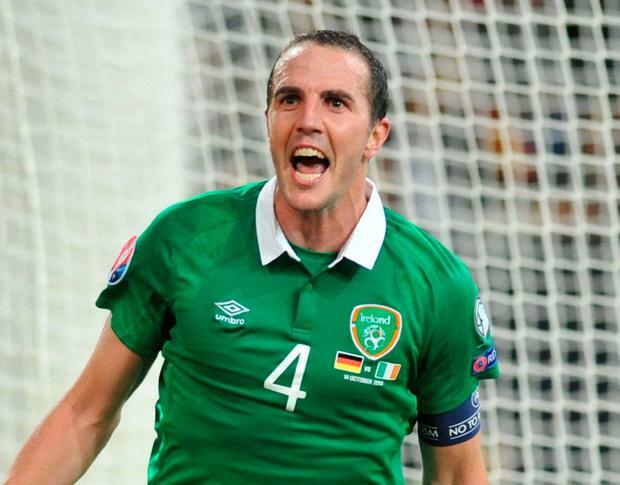 John O'Shea will start on the occasion of his 118th appearance for Ireland this evening, but the plan is that he will be substituted before half-time. It is a time for celebration and reflection. O'Shea's goodbye is one of the main selling points for the friendly against the USA, yet the veteran can empathise with the players nervous about their big breakthrough. He got chatting with Seamus Coleman and Shane Duffy yesterday and they asked for the story of his debut, which was a 2-2 draw with Croatia in August 2001. It didn't end too well for the Manchester United youngster, a second-half sub, who tried to rough up the savvy Igor Tudor in the dying stages. "He's bullied me," recalls O'Shea, laughing. "My arm swung up in the air and touched the ball. I'm looking for a free out and the ref has given the penalty. I thought, things can only better. Alan Kelly is in the goal and he whispers to me 'That's a good start for you'." It did get better from there, although it took time to really achieve his goals in the green jersey. O'Shea missed out on the World Cup in 2002 when others felt he should have been brought along for the experience. He thinks he would have felt stronger about that if he'd featured in qualifying. But there was probably a part of him which thought such opportunities would be frequent. Instead, he had to wait until Euro 2012 in Poland; Euro 2016 was better, even if he lost his place during the tournament. The Waterford man speaks fondly about those early days for he accepts that he got a taste of an old school way of doing business. He came into a dressing-room with players who had learned their trade in the late '90s. In the Irish camp, the socialising was a staple of every gathering. "One of my first trips was Russia away (September 2002) and that was amazing," says O'Shea, with a knowing smile. "I said to myself 'I won't be missing a trip again'. Gary Kelly, those sort of lads, they made you feel so welcome. There was Robbie (Keane) and Duffer (Damien Duff) closer to my age but you had the older lads; they were nuts but brilliant to be around." "Different in the sense of the general public and how it has changed," O'Shea replies, "The social media aspect and that. But the younger lads bond quicker now over stuff like that as they are friends on social media. "The manager is cute enough to know when a team meal might be needed. You can't get away from stuff like that, it's still crucial. "Some of the (old way) is gone, but there are great fun lads about the squad now. Obviously the way they go about things would be a bit different." For O'Shea, the international break was generally a release from whatever stress he was suffering at club level. He was coming from the extremes at United and Sunderland. "Whether it was the pressure of trying to win a league or to stay in it, that change of scenery and the group we had was a major part in continuing for as long as I have," he says. "I didn't miss too many games." That was despite a selection of colourful send-offs from Alex Ferguson, who would find various ways to say 'Don't get injured'. The Scot has been the biggest sole influence in O'Shea's career and that will stand to him for his own coaching ambitions. "It was the man-management style," he explains. "Especially if you went into talk to him about not being in the team or something like that and you're coming out thinking 'I haven't even spoken to him about what I was supposed to talk about'. "That's a good art, and something I will always be hopeful of taking on with me." The end? Maybe it really is just about the end of the first half.